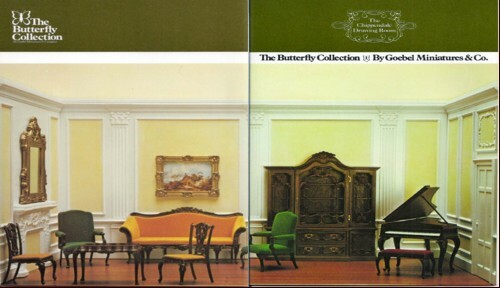 In the late 1970s, The Butterfly Collection offered to collectors a series of authentically accurate, perfectly scaled, one inch to one foot (1:12th scale) miniature furniture. The Butterfly Collection was marketed by Goebel through Hummelwerk which later became Goebel Miniatures. 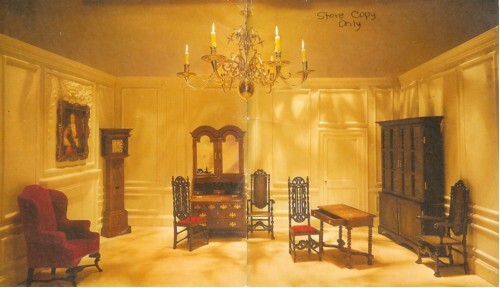 Two collections included at the time were the Stuart Library (shown on the right in its entirety) and the Chippendale Drawing Room (shown on the right. According to his article published in the August 1979 issue of Miniature Collector, John M. Blauer writes: "The Butterfly Collection pieces are painstakingly researched and originally are constructed in wood. These little masterpieces are used as the prototype to make copper molds, from which the Butterfly Collection is produced. The furniture is cast in high pressure resin, which captures proportioned wood grain, delicate marquetry, finely curved cabriole legs, turnings, fret work and working drawers and doors. Each piece is hand assembled and decorated, with special attention to drawer pulls, knobs, brass hinges and tiny keyhole plates." For additional information and images of individual furniture pieces in each of the collections, click the respective link below or the images shown.